Miura is known world-wide for their commitment to protecting the environment and their innovative and efficient boiler designs. Their EX Gas/Oil Series High Pressure Steam Boiler is the most versatile industrial steam boiler in the world. The EX design minimizes carryover and produces dry 99+% saturated steam in less than 5 minutes from a cold start. Faster start-up means less fuel used, greater savings, and more responsible use of precious natural resources. The MIURA EX Series design consists of rows of vertical tubes sandwiched between two rectangular headers. Both headers are encased in a castable refractory with only the tubes exposed to flame and/or combustion gases. The upper header is attached to the lower header only by the tubes. As the tubes expand and contract, the headers float up and down accordingly. This ’floating header’ concept greatly reduces stress and allows for the use of cold feedwater without the fear of significant thermal shock. The ’leaky tube’ problems associated with firetube and bent watertube designs have been eliminated. 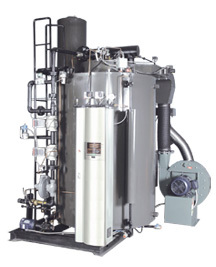 Miura’s EX Series boilers occupy 33% less floor space than typical firetubes, and do not require tube pull space. Compact design means much smaller radiation losses and larger fuel savings. Floating headers mean fast start-up. MIURA boilers produce fast steam in less than 5 minutes from a cold start-up. Standard firetubes require 1 to 1.5 hour start-up times. Miura’s unique design yields significant time and fuel savings. Scale is a problem all boilers have to deal with. Scale forms when boiler feedwater is not properly treated. Advanced scale formation acts as an insulator; only an eggshell thickness of scale results in a 10% efficiency loss, higher fuel bills and possible damage to the boiler system. As standard equipment, all Miura EX models are equipped with a thermocouple attached directly to a tube. Should scale begin to form, the Miura boiler will alert the operator – allowing the operator to trace and repair the source of the water hardness. The scale can be removed to restore the boiler to its original efficiencies – saving tens of thousands of dollars in wasted fuel and repair bills. Miura’s computer-aided design results in optimal heating surface transfer with minimal water content for fuel-to-steam efficiencies of 85%. Typical firetube designs can deliver up to 83% fuel-to-steam efficiencies. However, in actual use, MIURA averages 10 to 40% fuel savings over standard firetube designs. How does a 2% difference in fuel-to-steam efficiencies translate into a 10 to 40% ACTUAL FUEL SAVINGS? Contact your local Miura representative for details. 81 in. 91 in. 91 in. 94 in. 99 in. 99 in. 109 in. 130 in. 130 in. 136 in. 142 in. 142 in. 99 in. 120 in. 120 in. 146 in. 157 in. 166 in. 2 in. 3 in. 3 in. 4 in. 4 in. 4 in. One 2 in. One 2 1/2 in. One 2 1/2 in. One 2 1/2 in. Two 2 1/2 in. Two 2 1/2 in. 1 in. 1 in. 1 in. 1 1/4 in. 1 1/4 in. 1 1/2 in. 2 in. 2 in. 2 in. 2 1/2 in. 2 1/2 in. 2 1/2 in. 3/4 in. 3/4 in. 3/4 in. 3/4 in. 3/4 in. 3/4 in. One 3/8 in. One 3/8 in. One 3/8 in. Two 3/8 in. Two 3/8 in. Two 3/8 in. Two 1 in. Two 1 in. Two 1 in. Two 1 in. One 1 in. & One 1 1/4 in. One 1 in. & One 1 1/4 in. 14 in. 20 in. 20 in. 20 in. 26 in. 20 in. Equivalent output calculated from and at 212°F (100°C) feed water at 212°F (100°C) steam. Thermal efficiencies are based on high heating values of fuels at 68°F (20°C) feed water. UL and c-UL approved for natural gas or propane. Gas consumption based on natural gas with high heating 1004 BTU/SCF. Safety valve outlet size may change depending on the pressure setting. All Miura steam boilers are fully packaged and test fired at factory. Built to meet or exceed UL and ASME standards in U.S.A.; c-UL and B-51 standards in Canada.